Skylanders started it and Disney took it to another level, but if there's one brand that was almost built to take real-life toys and put them into an interactive game world, it's LEGO! As with any of these games, players start with a portal and a set of figures that they can bring to life in the game by using it. From there they can expand with new packs of toys and limitless possibilities! 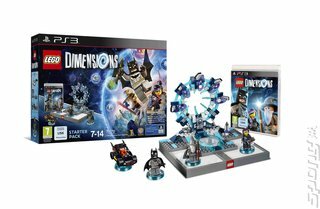 LEGO Dimensions features characters from across the spectrum of previous LEGO games, and a lot that have never been given the bricks treatment in a game before to boot. They include DC Comics, The Lord of the Rings, The Lego Movie, The Wizard of Oz, The Simpsons, Lego Ninjago, Doctor Who, Back to the Future, Portal 2, Ghostbusters, Midway Arcade, Scooby-Doo, Lego Chima and Jurassic World. That lends itself to some pretty interesting possible combinations. Batman and Homer? Sure! Shaggy and Gandolf? Why not?! The Doctor and Marty McFly? It would actually be criminal not to. Clearly, to bring all these characters together something must be amiss. When portals start opening across the LEGO multiverse, Gandalf, Batman and Wildstyle bravely jump into the fray to find out what's happening. As they journey to crazy locations, it quickly becomes apparent that Lord Vortech is summoning villains from across the different LEGO worlds. His power grows and worlds mix, boundaries are crossed and all kinds of wild and weird team-ups start to happen!